It’s a technical era of technical solutions, but it’s also the era of severe competition. We gotta engage and uncover quality products and I know personally how tiring that can get. There is a massive amount of frauds or low-quality products, and one must dig in deep to find solutions which are worth the money they cost. Same is the scenario with web-hosting companies. 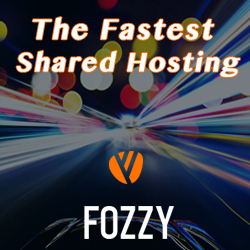 It’s no secret that there are like a gazillion web hosting providers claiming to be the best in the market. 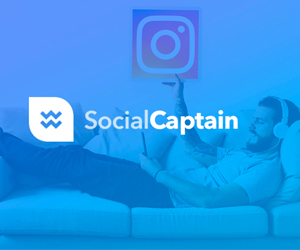 Some even claim low or cheap rates for their services, though the million dollar question still remains; is their hosting profitable for your website? If you one of those perplexed intellectuals who doesn’t know which hosting provider to choose, then I wouldn’t blame you. We’ve all been there. 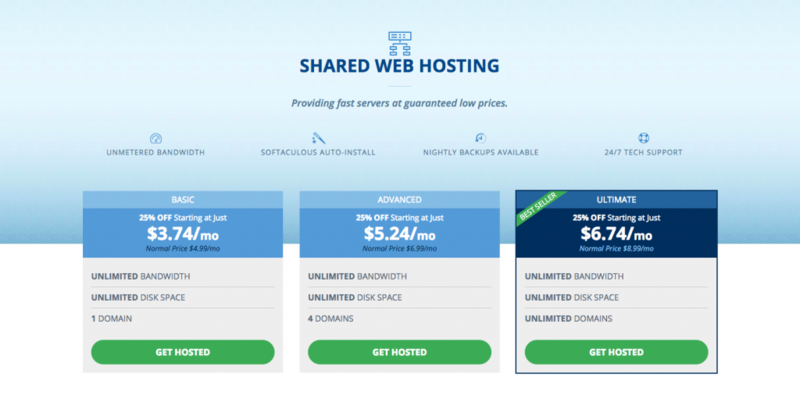 In this article I’ll be reviewing HostWinds, a premium web hosting company and we’ll discover together whether their services are praiseworthy or not. 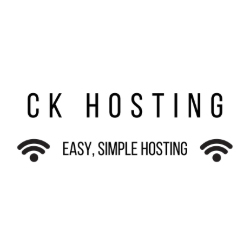 Founded in 2010, with well over 8 years of experience and brilliance in the web hosting industry, HostWinds have served with paramount quality and eminence. 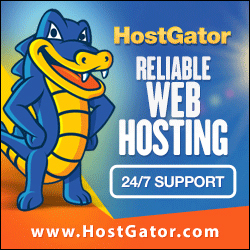 According to their worldwide clients and critics, their services are reliable and are budget-friendly in comparison with several other web hosts out there. HostWinds serves with one goal in mind, which is to help the customers derive maximum satisfaction from their solutions. Let’s see if the features offered by HostWinds are really living up to the standards or not! If there’s one thing excellent about HostWinds’ customer support, it’s their support ticket’s response. I was in awe of how rapid they were to reply. It’s rather easy to reach the team at HostWinds and their average response time is 7 minutes, however, when I created a ticket to ask for their support since I was stuck with a query, they responded even faster than that. Their team is polite and all complications I had were sorted without going through much of a fuss. HostWinds’ support is available every second of the day and effortlessly accessible as well. Everyone wants premium service for themselves. I mean its human nature to want the best and I’m really happy to say I was satisfied with the performance I noticed HostWinds’ hosting was serving. I got exactly the quality of the services I had hoped for and its speed certainly lived up to the standards. I researched deep into it so I could provide you guys with facts, and I came up with the knowledge that HostWinds’ secret of brilliant speed is their optimized routing. I think it’s smart of them to optimize their IP routing through the most premium channels to secure the highest speed possible. I wasn’t sure initially when I hosted with HostWinds in the first place. I didn’t know how to trust their solutions blindly. You cannot blame me since it’s a universal fact that trust is something which is hard earned. All things aside, I can now declare that HostWinds has officially earned my faith. I was given a money back guarantee when I was first set-up with HostWinds. In case I didn’t like what they were offering, I could just ask for my money to be returned within 60 days. Two whole months were more than enough for me to realize that HostWinds was more than capable of providing definite outcomes. The money-back feature allows the customers to be independent and decide on their own whether HostWinds is worth making a deal or not. HostWinds’ website is claiming an exact 99.99% uptime guarantee. On the other hand, I had to make sure if their uptime guarantee is really accurate or just deceiving. After all, many web hosts offer false 100% uptime guarantee on their servers to lure customers and ultimately fail living up to their own claims. This could lead to a lot of misleading and distrust over the clients. HostWinds, nonetheless, is the one which truly supplies. My own sites hosted with them are available and accessible 99% percent of the time. They don’t lag and aren’t sluggish. Personally, I could not have asked for a better provider than HostWinds. The customer support is actually very helpful. I conducted this out myself and the fact that how quick they are to respond to customers just illustrates the dedication level shown by the team of HostWinds. They are amazingly polite, and they maintain the fine balance between professionalism and at the same time being friendly. I was at much ease interacting with them and soon discovered that all members of their hardworking team are skillful experts. HostWinds’ team is reliable and effortlessly easy to contact via live support, chat, tickets, or email. What else can you ask for, right? Now I might sound a bit exaggerating, but believe me, I am just merely stating out the truth. 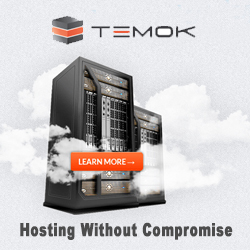 The quality granted by HostWinds is in contrast with its pricing plans. I personally think that I’ve hit a jackpot since their hosting is paying me moderately and offering me benefits worthy of much more. 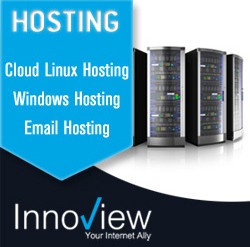 HostWinds’ Shared Web Hosting is offering three packages. You get 1 domain with Basic plan costing $3.74/mo, 4 domains with Advanced plan costing $5.24/mo, and unlimited domains with Ultimate plan costing $6.74/mo. 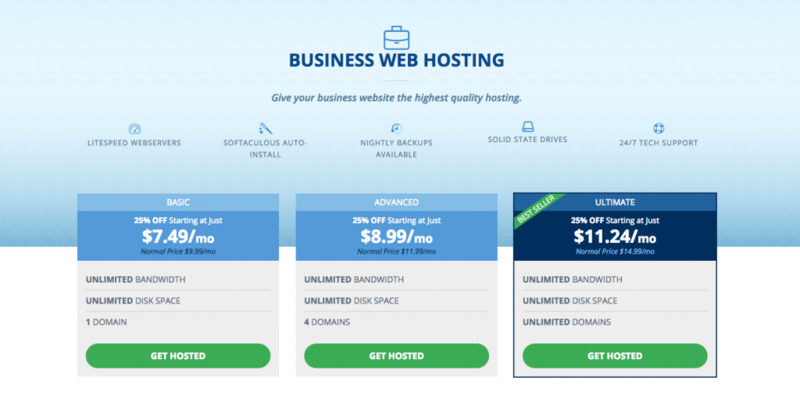 In Business Web Hosting you get 1 domain with Basic plan costing $7.49/mo, you get 4 domains with Advanced plan costing $8.99/mo and you get unlimited domains with Ultimate plan costing $11.24/mo. 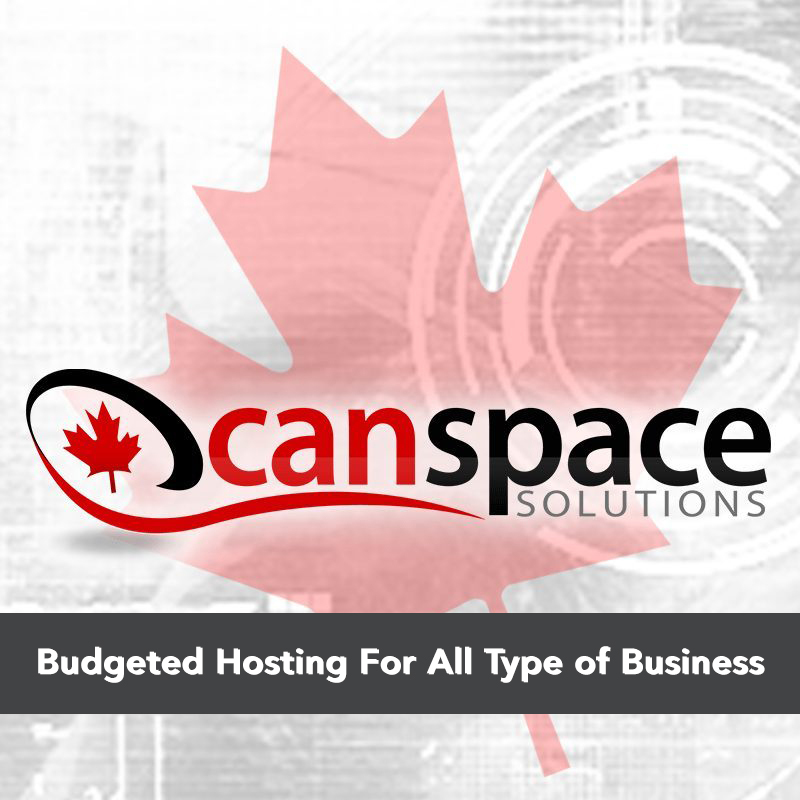 In Reseller Web Hosting, you get 10 cPanel accounts with Basic plan costing $17.50/mo, you get 25 cPanel accounts with Advances plan costing $35.00/mo and you get 75 cPanel accounts with Ultimate plan costing $68.75/mo, along with free nightly backups. 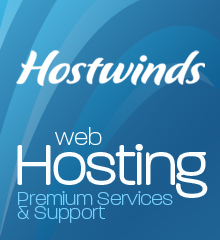 HostWinds Cloud Hosting packages are ranging from $4.49/mo to $22.49/mo. These four cloud packages are offered with fully managed hosting, custom templates, backups & snapshots, along with several other benefits. 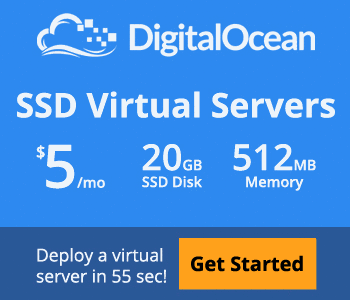 HostWinds’ fully Managed Enterprise VPS Hosting ranges from $7.49/mo to $39.49/mo. 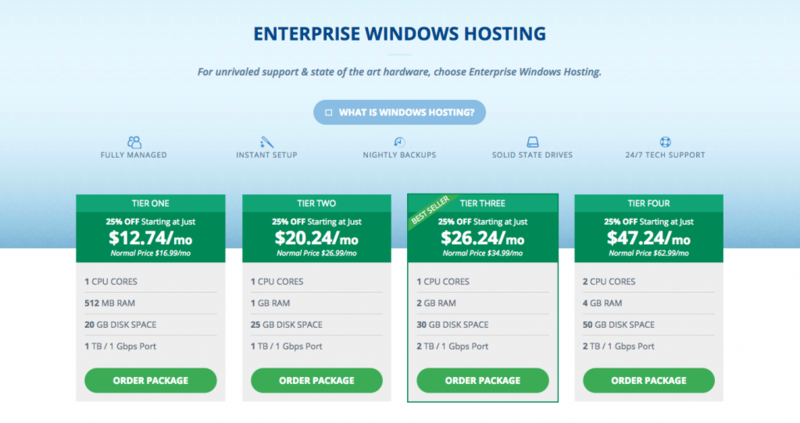 HostWinds’ fully Managed Windows Hosting ranges from $12.74/mo to $47.24/mo. Note- Unmanaged VPS and Windows hosting plans are starting from $4.49/mo and $9.89/mo respectively. HostWinds’s Dedicated Server plans are ranging from $75.00/mo to $125.00/mo, along with nightly backups and 99% uptime response. I really don’t think that I need to say more in favor of HostWinds. It’s for everyone from small businesses to medium sized corporations. I was thoroughly satisfied with the amount of hard work their team spends so that customers like us could derive utmost pleasure from their offerings. I also think that they are doing us all a favor by providing such high-class hosting in a rather inexpensive billing. I am happy with HostWinds and I’m sure you’ll be too. I definitely recommend it everyone out there. 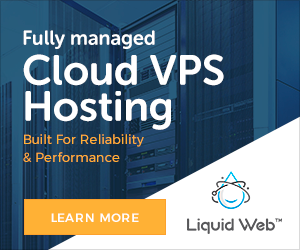 Liquid Web Review – Managed Hosting Without The Worry.